This is the question we were tackling at our February 1 arts education policy roundtable. This was a continuation of a conversation that began at our April 7, 2017 roundtable about the teaching artist shortage, which prompted us to survey arts educators about teaching artist pay practices. 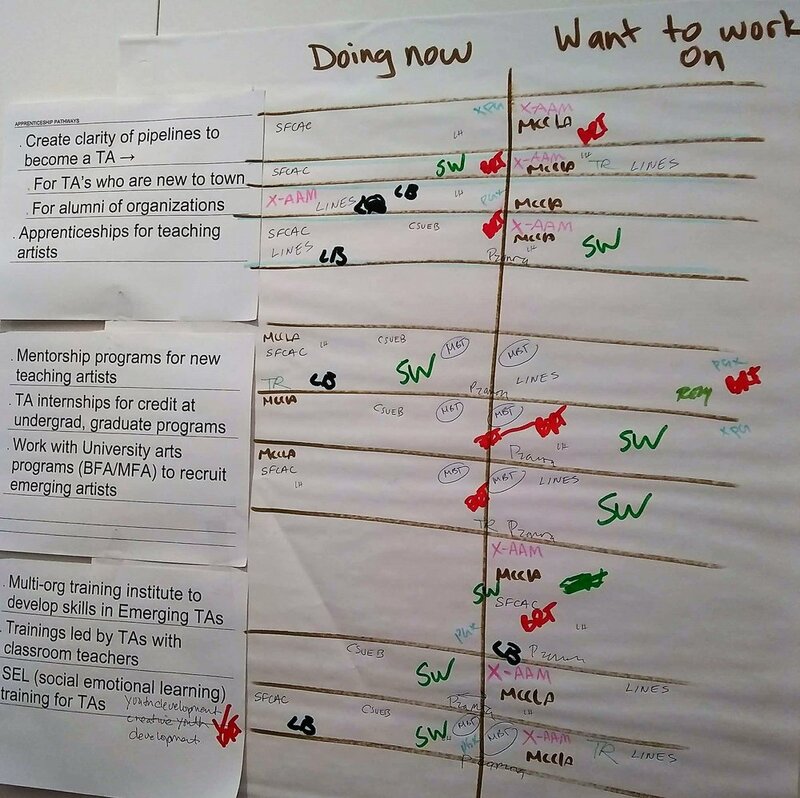 At a special event last year, Aimee Espiritu helped us work together to develop a list of strategies for recruiting and retaining teaching artists. 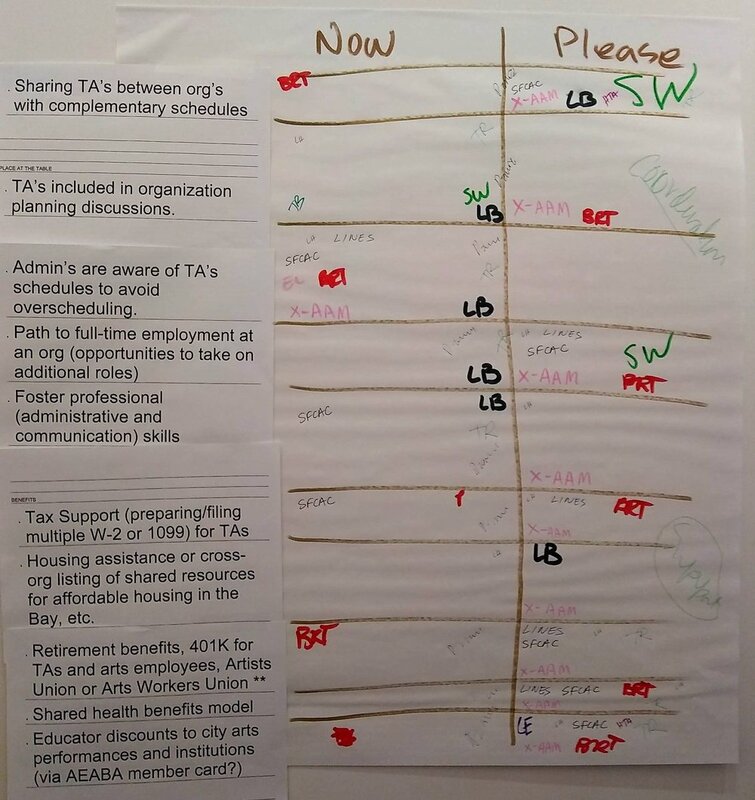 This list became the foundation for the work we would do at our meeting last Friday. This meeting was filled with people in management positions at arts education organizations. We used the “voting with your feet” practice to have everyone go to a place in the room indicating with their agreement with various questions. We found that most people had some say in hiring practices and that everyone found it difficult to find candidates to fill teaching artist positions. We were also joined by Jean Johnstone representing the Teaching Artist Guild and by Rhiannon MacFadyen, director of Emerging Arts Professionals of the Bay Area. 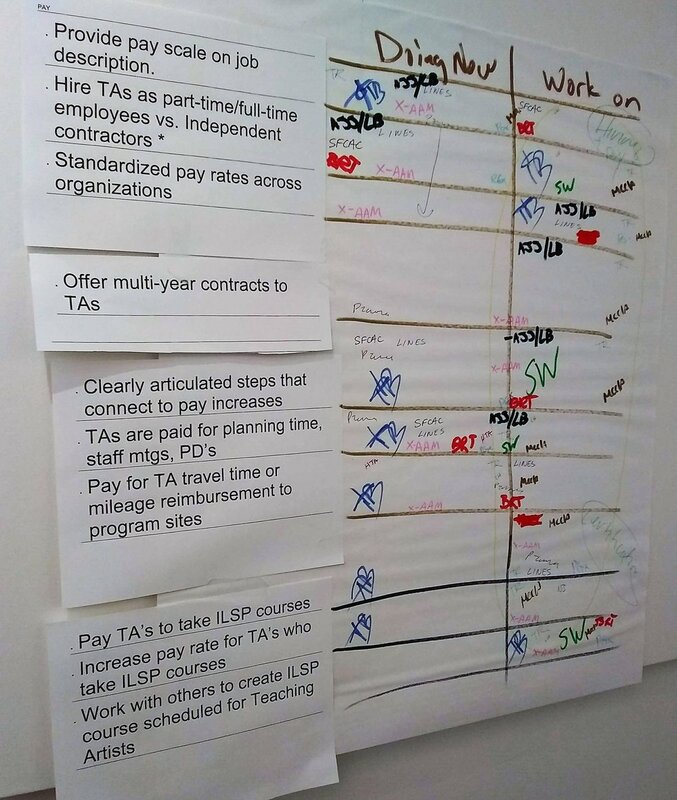 We put a list of ideas on the wall about how organizations could better recruit and retain teaching artists. Note how many organizations are willing to take on these challenges! Based on these ideas, we broke into two groups. 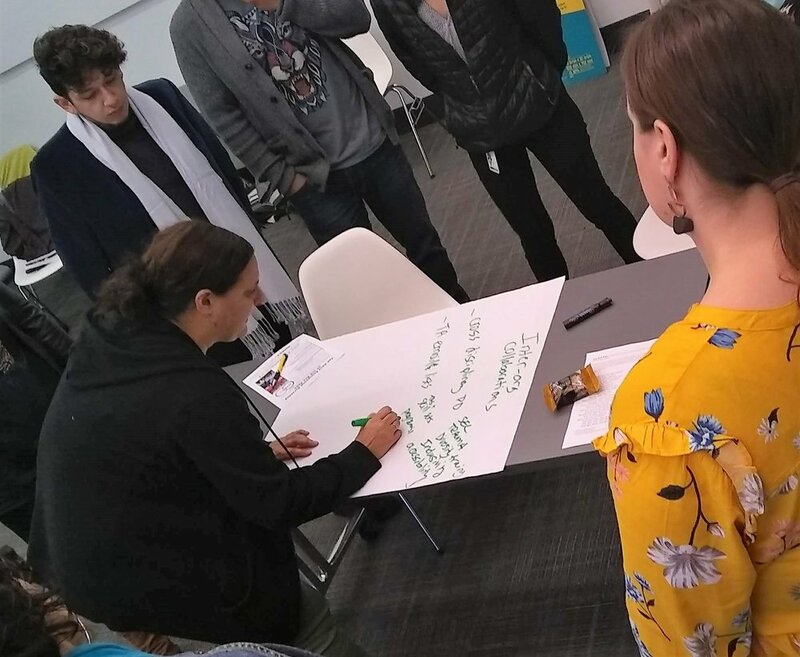 The other group would discuss how organizations collaborate to find ways to collaborate so that teaching artists could more easily fill their time with multiple gigs. 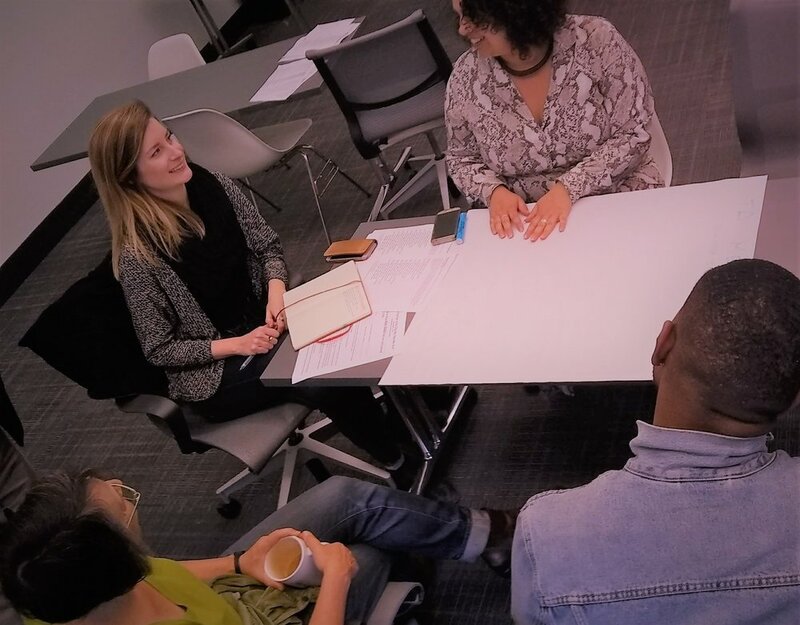 One group would discuss creating teaching artist meetups and exploring ideas around supporting teaching artists as artists and creative professionals. Rhiannon MacFadyen of Emerging Arts Professionals and Lindsay took leadership at the teaching artist meet-up table. 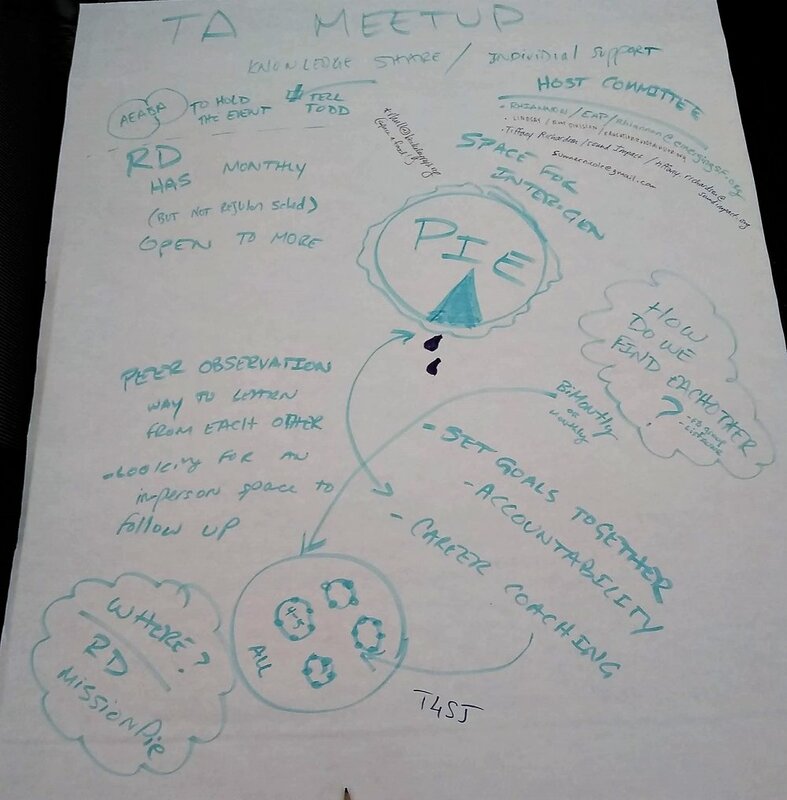 This group cooked up some ideas for a teaching artist meet up that could be held bi-monthly at Mission Pie or Root Division, and also considered how to support some system for peer career coaching. The Arts Education Alliance of the Bay Area is planning to have an event in coordination with the Boys & Girls Club citywide arts exhibit at SF Cameraworks that will be focused on teaching artists. Save the evening of March 20 for our first Teaching Artists meetup. 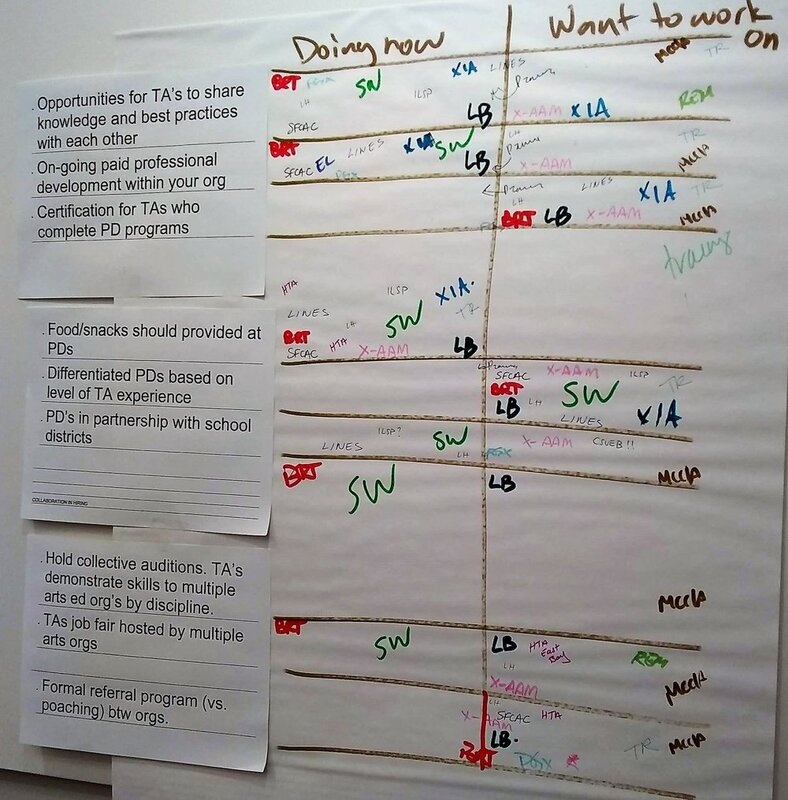 Elana Lagerquist of StageWrite took leadership (in the form of a fat green marker) of the inter-org collaboration group. Attendees were enthusiastic about finding ways for organizations to collaborate, but, as you can see, also were able to make a long list of reasons why collaboration can be difficult. Some organizations have been actively making these ideas into reality. On August 24, 2018, AEABA collaborated with 17 organizations to host a teaching artist open call at Berkeley Rep attracting 49 theatre teaching artists to share and show off their skills. This group is planning to repeat the event on a Friday in March at the Berkeley Playhouse and is interested in adding other disciplines for another open call in August 2019. Which of the action items does your organization already do? Which of the items will you try to implement in coming months? Add your ideas in the comments. We also welcome you to report on your progress at our member meeting on June 6, 2019.